Your efforts have led to some amazing milestones and I wanted to take a moment to congratulate you! First, your PTA is one of 452 that earned the Head Start Award. Congratulations! By recruiting 75% of last year’s total membership, you are well on your way to having one voice for every child on your campus — and the school year has just begun! The other milestone that you made possible is unprecedented — Texas PTA membership growth in August. This is especially significant since we are in the midst of a legislative year and every member counts when we advocate to make every child’s potential a reality at the Capitol. School funding will once again be in jeopardy and we want to send a powerful message to Legislators. The Early Bird and many other membership awards are well within your reach. The next award deadline is September 30. PTAs must submit membership rosters and dues for at least 100% of the previous year’s total membership. I am confident that you won’t stop until you have one member to represent every child on your campus. Visit http://www.txpta.org/my-pta/awards/ to learn about each opportunity and their deadlines. Your Head Start award emblem is a badge of honor we encourage you to showcase loud and proud! Share it in your PTA emails, on your social media channels and your PTA’s website. Notify your school district of the distinguished honor and keep in contact with them throughout the year. Sus esfuerzos obtuvieron resultados que superaron los requisitos para el Premio Head Start. En primer lugar, su PTA es uno de los 452 que ganaron el Premio Head Start. ¡Felicidades! Al reclutar 75% de membresía total del año pasado, usted está en camino de tener una voz para cada niño en su escuela y el año escolar acaba de comenzar. El otro resultado que usted ha hecho posible es un crecimiento de miembros de Texas PTA para el mes de agosto. Esta medida es particularmente importante ya que estamos en medio de un año legislativo y cada miembro cuenta cuando estamos abogando por hacer el potencial una realidad de todos los niños en el Capital. La financiación escolar estará de nuevo en peligro y queremos enviar un mensaje poderoso a todos los legisladores de Texas. La próxima fecha límite de premio es el 30 de septiembre, cada PTA debe presentar su lista de membrecía y cuotas para el 100% o más de membresía total del año anterior. Estoy seguro que no dejará hasta obtener un representante de cada niño en su escuela. Visita http://www.txpta.org/my-pta/awards/ para aprender acerca de cada oportunidad de premios para su PTA. Su emblema de premio Head Start es una medalla de honor. ¡Le animamos que demuestre su trabajo fuerte y orgulloso! Compártalo en su correo electrónico de PTA, en sus canales de comunicación sociales y la página web de su PTA. Informe a su distrito escolar del premio que ha recibido. Recuerde de mantener contacto con su distrito escolar durante todo el año. About PTA Board Members Contact Us! Member Benefits Texas PTA Head Start Award What is PTA? Clean It and Green It event is organized by the City of Frisco. Join us to pick up trash and “green” our school! Participants are welcome to attend the FREE event at IKEA after for bounce houses, face painting, and a free lunch! Just in time for Mother’s Day and Teacher Appreciation Week – 25% of sales will be donated back to Phillips! 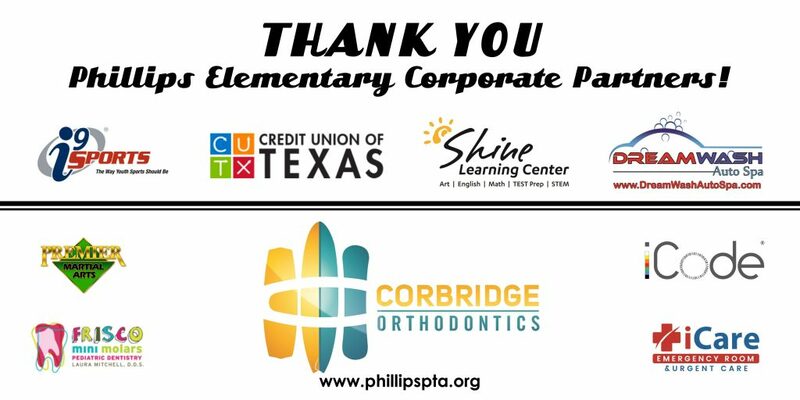 © 2019 Phillips Elementary PTA.